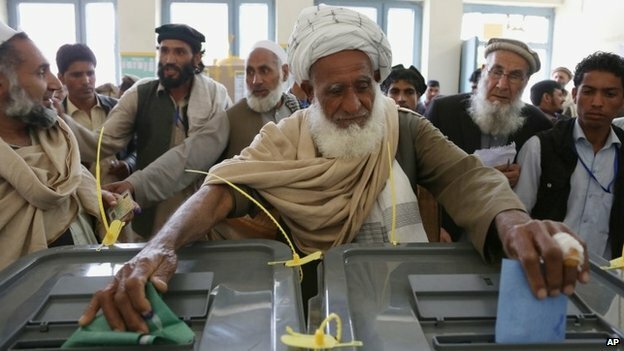 Afghanistan’s Independent Electoral Commission (IEC) chairman has reported that more than seven million people had voted out of 12 million. Unofficial results indicate that none of the eight Afghan presidential runners will be able to reach the magic figure of 50+1 percent of votes. Dr Ashraf Ghani and Dr Abdullah are in close competition. Yet both will have to face a runoff, later next month. According to the latest tally, Dr Ashraf Ghani has bagged 42.10 percent of votes, Dr Abdullah 40.72 percent and Zalmai Rassoul 7.66 percent. Abdul Rab Rassoul Sayyaf polled 6.16 percent, Qutbuddin Hilal 1.73 percent, Mohammad Shafiq Gul Agha Sherzai 1.13 percent, Daud Sultanzoy 0.30 percent and Hedayat Amin Arsala 0.18 percent. The election commission has estimated that two-thirds of those who voted were men and one third women and the turnout was so heavy that some polling stations stayed open for additional four hours to allow everyone queuing to vote. It was a great achievement for the Afghan people that so many voters, men and women, young and old turned out in such large numbers, to have their say in the country’s future. Land mark decision by President Karzai of not signing Bilateral Security Agreement with the US is the single significant factor that created an environment for high voter turn-out. As for Taliban effort to disrupt the polls, Afghan interior minister has said that 140 attacks on polling stations were foiled and 89 attackers were killed on the election day. Seven Afghan soldiers and four civilians were also killed, while 43 civilians sustained injuries. Overall, Taliban failed to carry through their plan of keeping the voters away from the polling process. IEC, Afghanistan’s top security institutions and a number of presidential candidates have applauded the Afghan National Security Forces (ANSF) for ensuring the safety of voters. Credit goes to the authorities that managed tight security in Kabul and other cities. Pakistan also increased security along the Durand Line four days ahead of the elections to help in orderly conduct of the polls. Whatever the final outcome, it is a certainly a step forward and Afghanistan has taken a new turn. Women of Afghanistan particularly showed keen interest in the election which is reflective of their interest in the destiny of Afghanistan. This is a step in the right direction. Millions of Afghans defied Taliban threats and rain, thus underscoring their enormous hope from the elections. As NATO/ISAF continue to drawdown, country’s new leader will find an altered landscape as the country’s wobbly security forces struggle to face down a ferocious insurgency on its own. Afghans have effectively communicated to the war-fatigued world they want their voices heard. According to BBC, Nazia Azizi, a 40-year-old housewife, was first in line at a school in eastern Kabul. “I have suffered so much from the fighting and I want prosperity and security in Afghanistan. That is why I have come here to cast my vote,” she said. “I hope that the votes that we are casting will be counted and that there will be no fraud in this election.” Probably, none could better define the post election challenges to Afghan nations than this house wife. Prime Minister Nawaz Sharif has congratulated President Karzai and the people of Afghanistan on successfully holding and completing the electioneering process. “Participation in the democratic process by the Afghan people would play a significant role to bring peace and stability in the region,” the PM emphasized. The prime minster hoped that not only a peaceful transfer of power may take place in Kabul as was done in Pakistan last year but also wished that democracy may flourish in the country. He said Pakistan would not only help and support Afghanistan in strengthening democracy but would also work in collaboration with the new leadership in Afghanistan for binging peace and tranquility in the region. However, it is too early to ascertain as to who would be the next president. Who so ever he may be, he will be confronted with Herculean challenges. Most important dilemma is whether the electoral exercise would translate into peace and calm. Taking cues from Pakistan that had its elections last year, peace did not return, until the government entered into formal dialogues with Pakistan Taliban and worked out a fragile ceasefire. Like Pakistan, failure of Afghan government to integrate Taliban into the political process prior to elections will continue to haunt the new Afghan president. In run up to elections, Taliban persistently demonstrated their capacity and capability to launch attacks at places and timing of their choosing. Though they did not, or could not launch any major attack on the election day, it would be naïve to write off their potential. Over one thousand polling stations remained closed and nearly 200 were attacked. No matter how fair, credible and popular the elections are, Afghanistan has a long way to go before it becomes a sustainably stable state. Strategists and observers from the entire world cutting across all streams of opinion makers have been describing Afghanistan’s election as a water shed and of critical significance for its stability— all were careful to not to indulge in quantifiable impact of the process. Despite high turnout, practically the new Afghan president will enjoy only partial mandate and his immediate task would be to make his mandate nationwide though a meaningful reconciliation and integration campaign. Insistence on stationing post-2014 residual garrison is an implicit acknowledgement that Afghan security forces are still under formulation. There’s question mark on their state of preparedness. In 2012, half of Afghanistan’s army was estimated to be addicted to drugs, and last year 65 employees with the main spy agency were fired due to addiction. Nearly 95 percent of military and police recruits are illiterate. A report released in January by the US Special Inspector General for Afghanistan Reconstruction concluded that despite a $200 million American funded literacy program, half of Afghanistan’s military and police force will probably remain illiterate until decade’s end. Afghan army suffers from a 33 percent annual attrition rate. According to US Director of National Intelligence James Clapper, 30,000 soldiers deserted in 2013—out of a total force of 185,000! Anyone thinking of overpowering militants through international or Afghans security forces need to have his or her head examined. Success of Afghan government would lie in elimination of the need to employ its security forces on mass scale and for long duration. This could be done through a wholesome political process combined with a healing touch. Moreover, Taliban and their allies aren’t Afghanistan’s only destabilizing forces. Governance, economy, drugs, appeal to recruit as Taliban, and warlord militias present formidable challenges, each with a potential to cause effects ranging from chaos to paralysis. Poverty, insurgency and thorny relations with both neighbours and regional powers also pose serious challenges. Corruption is eating away the fabric of Afghan society. The government and international community are so focused on the violence that economy and corruption rarely get due priority. Economy’s weakness fuels the insurgency as some of the young people who can’t find jobs turn to the Taliban who offer salaries similar to those offered by the national police and army. Unless there are long term donors, Afghan government won’t be able to afford the cost of security forces. All three front runners mistrust each other, prior to elections they had persistently warned of a fraud that could play a big role in the vote. Abdullah Abdullah showed his concerns about “industrial-scale fraud” in the vote. Ashraf Ghani had confided with the “Guardian” that his team was trying to pre-empt the kind of fraud that riddled the 2009 voting. Most serious public suspicion fell on the campaign of Zalmai Rassoul. His campaign was reported to President Karzai for abuse of government resource. After the elections, front runner Ashraf Ghani and another candidate Gul Aghan Sherazri have claimed occurrence of electoral fraud. Diplomats working on the vote say the result only has to be “good enough” – fraud that is not truly outrageous, and a candidate is thrown up who is generally acceptable to Afghans. A legitimately elected new leadership, particularly one seen as effective and above all clean, could conceivably help convince Afghans that their government is a better alternative to other options. Pakistan’s support and facilitation of an inclusive Afghan-led and Afghan-owned peace and reconciliation process remains sincere and steadfast. Pakistan’s positive role in this context is internationally acknowledged. Pakistan has been careful not to side with any candidate. Pakistan did its bit to facilitate elections in Afghanistan. It had sealed its border before the elections by deploying additional troops. After the elections Pakistan Foreign Ministry commented: “We congratulate the brotherly people of Afghanistan on the milestone Presidential and Provincial Council elections. They braved the security threat and inclement weather and turned up in millions to exercise their democratic right to choose the future leadership. We wish the Afghan electoral institutions well as they take the next key steps in ensuring the successful completion of the electoral process. Like always, the people of Pakistan stand in strong solidarity with the Afghan nation at this historic moment, and as it moves forward in its peaceful democratic transition”. Hopefully, the new Afghan leadership will look inwards to resolve the grave issues rather than finding external bogies to divert attention from own inadequacies.